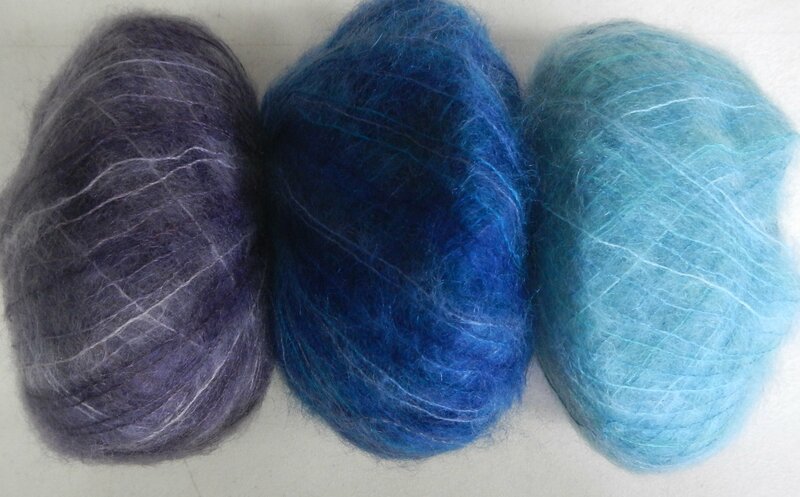 I love how lightweight and cozy these fine mohair/silk blends like Bliss's Angel and Plymouths new Kid Gloss are. Lots of yardage makes for a very reasonable price point, bigger needles than you'd expect for how fine these are (I usually knit these on US 5-7) so the project goes pretty quickly, and not heavy and bulky to wear, yet insulating! This latest one is kettle dyed so it has slight "tonal" (all within the same color range) variation, much like the Malabrigo and Manos tonals that everyone loves so much! For a version with a higher silk content, check out Shibuit's Silk Cloud. 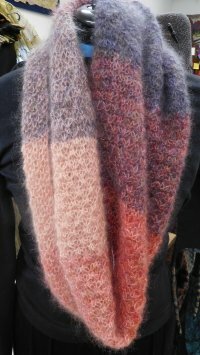 The gradient cowl below can be knit in an approx 7" x 44" size with just 1 skein each of 3 colors. The pattern is sent free with the yarn purchase. 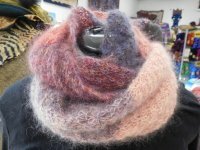 This yarn is 72% kid mohair and 28% silk and featuring 229 yards/sk it is recommended between 4.5 and 6 sts/inch.